The MCAT is composed of four sections – (1) Biological and Biochemical Foundations of Living Systems; (2) Chemical and Physical Foundations of Biological Systems; (3) Psychological, Social, and Biological Foundations of Behavior; and (4) Critical Analysis and Reasoning Skills. Each section is scored from a low of 118 to a high of 132, with 125 at the center (i.e. 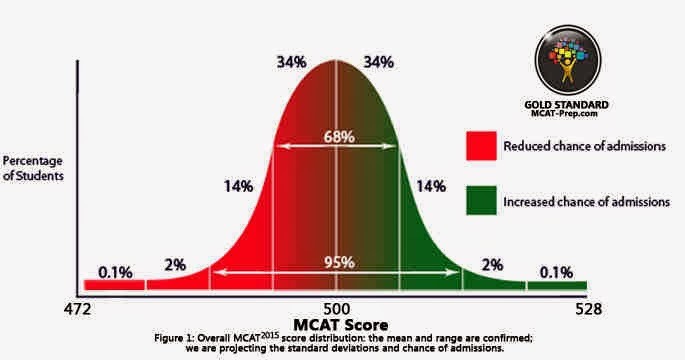 the mean or average new MCAT score). The total score will result from a combination of these sections’ scores. The total score will range from 472 to 528, with 500 at the center. Examinees will be given a score report that shows percentile ranks so that the student will know how he/she fared compared to others, confidence bands (intervals) that show the ranges where one’s true scores lie and score profiles that show one’s strengths and weaknesses in the four sections. It is difficult to predict how or if the issue of confidence intervals would be used to develop medical school admissions criteria. Will test: concepts related to processes that are unique to living organisms. College courses to take: Introductory Biology (two semesters), General Chemistry (two semesters), Organic Chemistry (two semesters), Introductory Physics (two semesters) and Biochemistry (first semester). Will test: concepts related to the mechanical, physical and biochemical functions of tissues, organs and organ systems in living organisms. College courses to take: Biochemistry (first semester), Introductory Biology (two semesters), General Chemistry (two semesters), Organic Chemistry (two semesters) and Introductory Physics (two semesters). Will test: your knowledge on psychological, sociological and biological factors that influence human perceptions and reactions as well as behavior and changes in behavior. While the above courses are important for MCAT prep, using a problem-based learning approach would improve a student’s MCAT scoring. Some helpful review materials are MCAT books, and videos. In addition, MCAT practice tests will allow you to apply what you learned in a timed environment.